It was August 30, 2011, and lacrosse fans throughout New England found out the bad news. The Boston Blazers had suspended operations, leaving a void of professional indoor lacrosse in the region. Three years later, the National Lacrosse League returns, this time at the Mohegan Sun Arena in Uncasville, Connecticut. 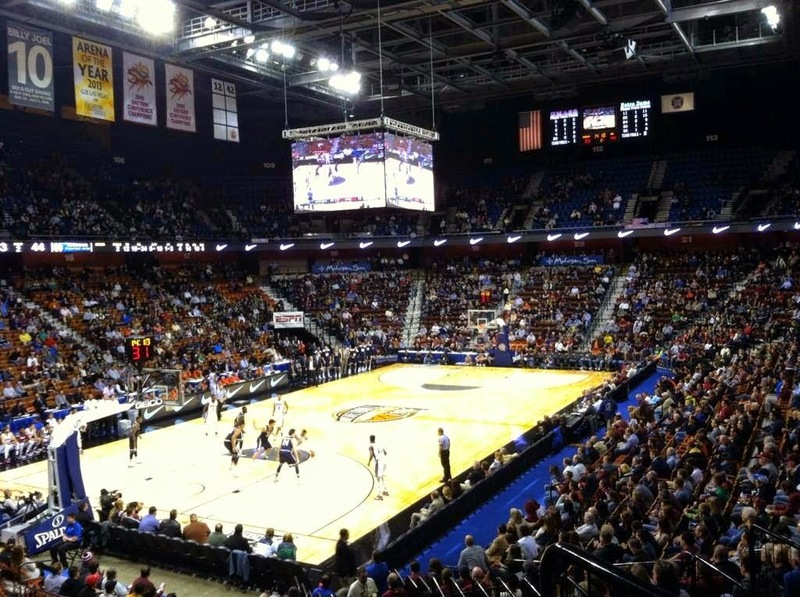 The 9,313-seat Mohegan Sun Arena in November 2014. Come Friday night, the New England Black Wolves will debut a new chapter in the history of their franchise, which recently moved from Philadelphia where they played since the inception of the league in 1987. The league was originally known as the Eagle Pro Box Lacrosse League before becoming the National Lacrosse League in 1998. The NLL is comprised of nine franchises with Buffalo, Rochester, Toronto and Minnesota making up the other teams in the Eastern Conference. The Western Conference includes Calgary, Colorado, Edmonton and Vancouver. The Blazers played three seasons at the 17,565-seat TD Garden from 2009 until 2011. As for single-game crowds, season-high attendances were 9,313, 10,302 and 11,273, respectively. The latter came during the franchise's final game - their first and only home playoff game. When the Black Wolves debut Friday at the Mohegan Sun Arena, it will mark the third time a professional indoor lacrosse team has played in New England. The original New England Blazers began playing in the Worcester Centrum in 1989 and moved to the Boston Garden in 1992 to become the Boston Blazers. The Blazers continued to play in the new FleetCenter until the end of the 1997 season when the Major Indoor Lacrosse League became the NLL of today. Fast-forward to 2015, and lacrosse has become the nation's fastest growing sport at both the high school and collegiate levels. A report released earlier in 2014 by U.S. Lacrosse shows that 746,859 players competed on organized lacrosse teams in 2013. There is no doubt that lacrosse is on the rise, and while the NLL may no longer be played in Boston, this Friday night at the Mohegan Sun Arena the region will welcome back indoor lacrosse after more than a three-year absence.